A few weeks back Creative Loafing released a “100 Dishes to Eat Before You Die” list that features 100 breakfasts, salads, meat entrees, desserts etc. around the city that everyone should try while they’re alive. I’ve had a few of them already like the salivating “Farm Egg” from Empire State South and the Super Food Salad, also from Empire. Or the roasted bone marrow with tuna tartare and quail egg from The Spence and of course Krispy Kreme donuts. But clearly we have a long way to go so yesterday we started. My girlfriend surprised me with a dozen donuts from Revolution Donut Shop in Decatur. Its featured item is the caramel and bacon donut (from the Breakfast segment). She also got plain glazed, chocolate covered yeast and cake, an apple turnover, a cinnamon sugar donut, a peach stuffed donut, and a blueberry glazed donut. Their strengths: Deliciously sweet glazes and fresh fruit for the fruit based donuts. My favorites were definitely the caramel bacon, all sweet and salty and yeasty, the textured cinnamon sugar donut and the blueberry glazed that reminded me of a fruity roll. Their weakness: The donuts are MAD THICK yo; too thick actually. I would love it if they toned down the dough action and made them slightly more delicate. 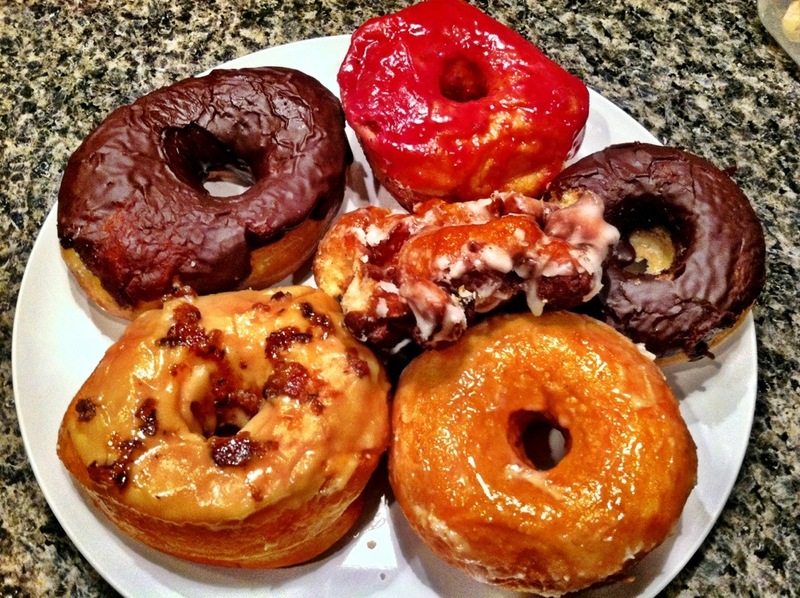 Maybe they make them so thick to add balance to the richness of the glazes…but still, skinnier donuts please. Nonetheless, one down and like 80+ to go.